Only surveys with publicly available crosstabs are used in the averages. Hillary Clinton averages an impressive 53-35% lead over Donald Trump among women. You have to travel back to 1972 to find a presidential candidate with a larger advantage than she among the female vote - and that, ironically enough, belonged to Republican Richard Nixon. Clinton's lead among women ranges from as high as twenty-eight points in one recent poll, to as little as eight points in another. And while Trump's 49-40% advantage among men is less impressive than Hillary's performance among women, it's still more impressive than Mitt Romney's 52-45% win in 2012. Trump ranges from as high as an eighteen point lead among men, to as little as three points. The largest gender-gap found by a single pollster this year is forty-one points! It stems from a February CNN survey finding Clinton leading 62-34% among women, with Trump winning men 54-41%. 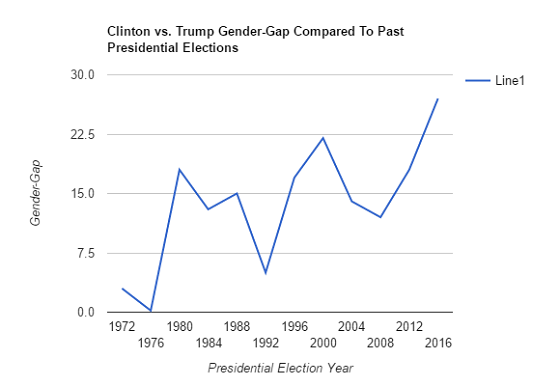 If the pattern above holds, 2016 looks likely to join 2012, 2008, 1996, 1992, and 1976 as presidential election years in which the Democrat performs better among women than the Republican does among men. The opposite was true in 2004, 2000, 1988, 1984, 1980, and 1972, where male support for the GOP ticket was stronger than female support for the Democrat. And if the general election horse race numbers fail to convince you of the potential for a widening gulf between the presidential preferences of men and women, consider the favorability ratings of Donald Trump and Hillary Clinton. Not surprisingly, you'll see there's a significant gender-gap here as well. *Economist/YouGov is a bi-weekly tracking survey. The numbers reported in the table above are a monthly average. On average, there is a twenty point gender-gap between Hillary Clinton's net favorability rating among women (-3 points) and men (-23 points). For Donald Trump, there is an average seventeen point gender gap between his net favorability rating among men (-15 points) and women (-32 points). The gender-gap in Barack Obama's and Mitt Romney's favorability rating at a similar point in 2012 did exist, but wasn't nearly as pronounced. The gender-gap is even more stark if you take out the one internet pollster, YouGov, which compared to the non-internet surveys used in the average, seem a bit outlier-ish. In the era of Trump, you can expect to hear lots about the many ways we're divided as Americans. Though if current polling holds, the battle of the sexes could give racial, class, and religious divisions a run for their money. "Of the eleven elections since 1972, Democrats have lost the female vote in five (1972, 1980, 1984, 1988, & 1992), all of which resulted in electoral landslide defeats for their party. " I get the first 4, but I think maybe you meant a different year for the last one (or maybe just put it in the wrong category), since you also cite 1992 as a year where Republicans lost men, and the Democrats won the election. Can you clarify? You are absolutely right. 1992 shouldn't be in there at all. There are only four elections where Democrats lost the female vote. Thanks for catching that. Post has been updated.